Wheel Rims - Set of 4 Dunlop Sunbeam Alpine Rims with hubcaps. Uses 14.5mm tyre suits cars like Sunbeam Alpine, etc. All rim sets are for 1:43 scale model rebuilds. Corgi & Dinky, etc. Wheel Rims - Set of 4 styled like Dunlop Sunbeam Alpine Rims with hubcaps. Uses 14.5mm tyre, O.D. (with tyre) 14.5mm : 3mm thick : 5.25mm thick at the inside axle stub : Rim O.D. 9mm : Axle stub 3.5mm dia. 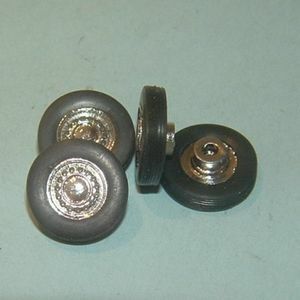 Axle size approx 2mm. Suits Sunbeam Alpine or custom models. All rim sets are for 1:43 scale model rebuilds. Corgi & Dinky, etc.